mom makes a mean cornbread! so soft and sweet, no need for butter it just melts in your mouth. so cornmeal, flour, eggs and sugar in tow i was ready to go! but it turned out totally gross! not to fear, i had the christmas spirit and kept going with my homemade feast. just when i was about to give up. 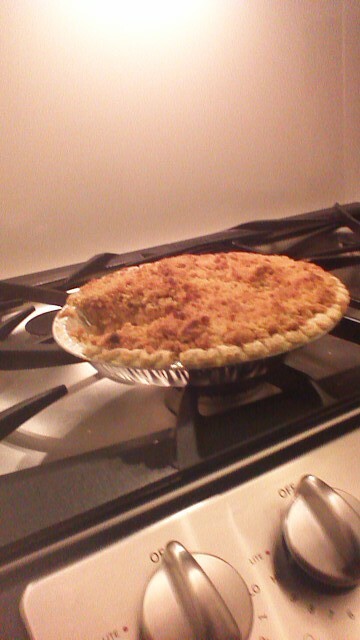 the time had come for me to make my famous apple crumble pie. AND it came out perfection. i do miss my grandmother during the holidays and wish i was home with my mom. but this holiday i also realized, home is where the heart is and my heart knows how to bake pie. 1 Response to "Sage’s Rage: Home for the Holidays"